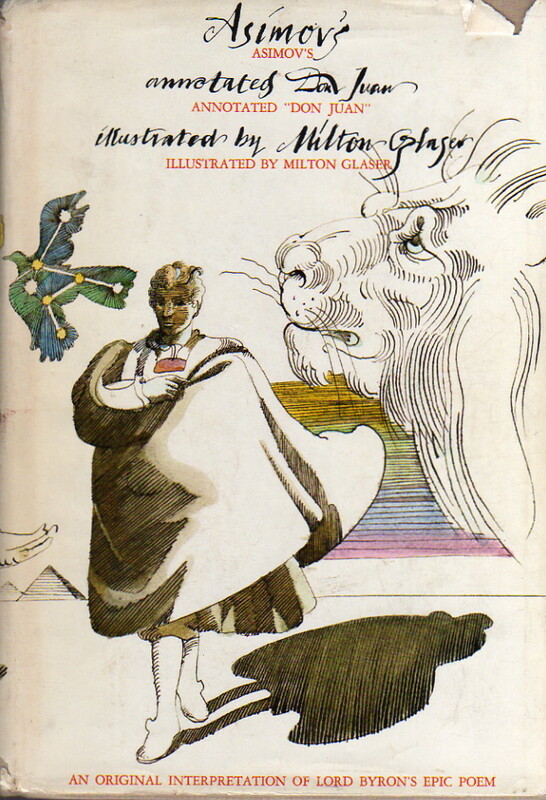 In this handsome volume, Isaac Asimov and Milton Glaser each adds his own form of modern illumination to one of the great comic epic poems of English literature: Byron’s Don Juan. Glaser’s witty, original drawings highlight the poet’s satiric attack on hypocrisy, complacency, and greed—particularly the varieties displayed by public figures. These thrusts of Byron’s verbal rapier are every bit as pertinent, provocative, and entertaining today as when they were first written. But the passage of time has brought one problem: the classical and contemporary allusions that fill the poem are often lost on today’s reader. This is the situation Isaac Asimov has remedied through his thorough, informative and concise footnotes, which also provide intriguing insights into the writing of the poem and its reception by the critics and the public. Together these attractive and useful additions make Byron’s masterpiece even more enjoyable, and cast new light on its dispassionately ironic—and peculiarly modern vision. Well, I must admit that my main reason for not particularly caring for this book is that it’s too big, too elaborate, and I really don’t like Byron all that much. In fact, I rather find him distracting from Asimov here. Asimov’s choice here of subject was entirely selfish—he loved Don Juan, but realized that most current readers wouldn’t understand what Byron was talking about most of the time without somebody to guide them. Now, there are a number of things I dearly love now having been introduced to them via Asimov: the Bible, Shakespeare, Gilbert and Sullivan, P.G. Wodehouse—but not Byron. One who does share Asimov’s love for Byron might therefore enjoy this book rather more than I do. The book is also really elaborate: beautiful paper, beautiful pictures, a slipcase—and, weighing in at $25, darn expensive for the early 1970’s. I’m astonished, as Asimov was, that such an elaborate production of a comparatively highbrow work should not have lost Doubleday tons of money. It’s a matter of audience. Asimov fans aren’t likely to want a copy of “Don Juan,” and people who enjoy Byron aren’t likely to feel comfortable buying a copy of “Don Juan” with annotations by a mere science fiction writer. As for the general populace who would like to own a copy of “Don Juan” and would be willing to get footnotes by a popularizer, they’re not likely to want to fork out $25 for a copy. This was done, by the way, at the peak of Asimov’s relationship with Doubleday, when they were willing to publish virtually anything he asked them to. In the 1970’s, Asimov was something of a cash cow for Doubleday. His science fiction books from the 1950’s were steady sellers, and since they were already typeset, the only real cost to Doubleday to keep them in print was the per-copy manufacturing cost. Asimov’s science essay collections brought in tidy sums, and since they were collections of pre-existing material and didn’t need editing of any sort, not even copy editing, publishing costs were comparatively low for them, too. In fact, pretty much everything Asimov wrote added nicely to Doubleday’s bottom line. He had become the kind of author a publisher is willing to indulge, since, even if there was the occasional disappointment along the way, keeping him with Doubleday would mean nice profits in the long run. It’s no real surprise that they were willing to gamble on Asimov’s Annotated “Don Juan”, but it is surprising that they would have invested so much money into it up front. Think about it from a publisher’s perspective, after all. Typesetting poetry by a well-known author from centuries past is more expensive than typesetting typical Asimovian prose: you need more skilled typesetters and better proofreaders. Nor can you count on having a clean, computerized copy of Byron’s poem to start with—you have to manually set the entire work. Moreover, typesetting footnotes is never easy, even when each page is divided into halves for text and footnotes, because they throw pagination off. (Notice how, even now, most publishers prefer endnotes.) Milton Glaser was a well-known artist, and therefore not cheap. Add to that the per-copy costs for the paper, binding, and slipcase. All of this would push the price to the consumer up, and pushing the price to the consumer up means pushing sales down. The result was not a real failure, but neither was it a genuine success from a business perspective, and Doubleday was much more cautious the next time around. Asimov’s next annotation, for the relatively better-known Paradise Lost and Paradise Regained, was distinctly less elaborately produced.